Rotate crankshaft, and set piston whose valve oil seal is to be removed to TDC. This will prevent valve from dropping into cylinder. Remove camshafts. Refer to EM-60, "Exploded View". Remove valve lifters. Refer to EM-60, "Exploded View". 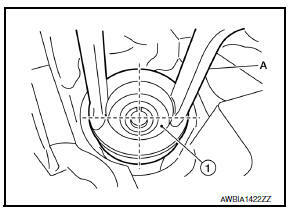 Install Tool (A) in the center of valve spring retainer to press it. 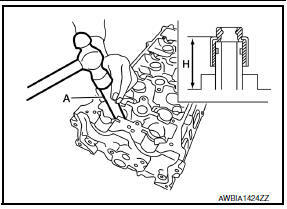 Apply new engine oil to valve oil seal joint surface and seal lip. 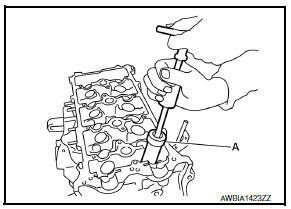 Press in valve oil seal to the height (H) shown using Tool (A). Remove front fender protector (RH). Refer to EXT-27, "FENDER PROTECTOR : Exploded View". Remove crankshaft pulley. Refer to EM-48, "Exploded View". 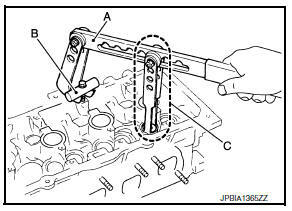 Remove front oil seal using suitable tool. Do not damage front cover and crankshaft. Apply new engine oil to new front oil seal joint surface and seal lip. Install front oil seal so that each seal lip is oriented as shown. Press-fit front oil seal using a suitable tool with outer diameter 57 mm (2.24 in) and inner diameter 45 mm (1.77 in). Press-fit oil seal straight to avoid causing burrs or tilting. Remove engine and transaxle assembly. Refer to EM-86, "CVT : Exploded View" (CVT models) or TM-28, "Exploded View" (M/T models). Remove clutch cover and clutch disc (M/T models). Refer to CL-17, "Exploded View". Remove drive plate (CVT models) or flywheel (M/T models). Refer to EM-94, "Exploded View". Remove rear oil seal using suitable tool. Do not damage crankshaft and cylinder block. Apply the liquid gasket lightly to entire outside area of new rear oil seal. Install rear oil seal so that each seal lip is oriented as shown. Press-fit rear oil seal using suitable tool (A) with outer diameter 115 mm (4.53 in) and inner diameter 90 mm (3.54 in). Do not touch grease applied onto oil seal lip. Press in rear oil seal (1) to the position as shown.